The Verdicchio dei Castelli di Jesi Villa Bucci Riserva is one of Italy’s top white wines, and also ages splendidly. It’s also a bottling of significant historic importance – the first to reveal the huge potential of the Verdicchio grape and its wines to Italy and the world. Ampelio Bucci worked for more than 20 years in Milan’s highly competitive and glitzy fashion industry as a consultant in design direction and marketing. Until two years ago, he also taught this subject at the Domus Academy in Milan and at one of the city’s universities, the Libera Università di Lingue e Comunicazione (IULM). As if all that wasn’t enough for his resumé, Bucci also happens to make two of Italy’s best white wines, including the Verdicchio dei Castelli di Jesi Villa Bucci Riserva. The Bucci family has owned their estate in the Marche, near the town of Montecarotto where the family has its origins, since the 18th century. But it was Ampelio Bucci who first began making outstanding Verdicchio wines in 1982. The estate comprises 300 hectares in the western part of the Marche region, including 31 hectares under vine – 25 planted to Verdicchio and 6 to Montepulciano and Sangiovese. In addition to wine, Bucci produces other staples including durum wheat, peas, sugar beets, olives and sunflowers. The estate has been officially certified for practicing organic agriculture for over 25 years, but like many of the great wine estates of Italy, Bucci doesn’t boast about that fact. 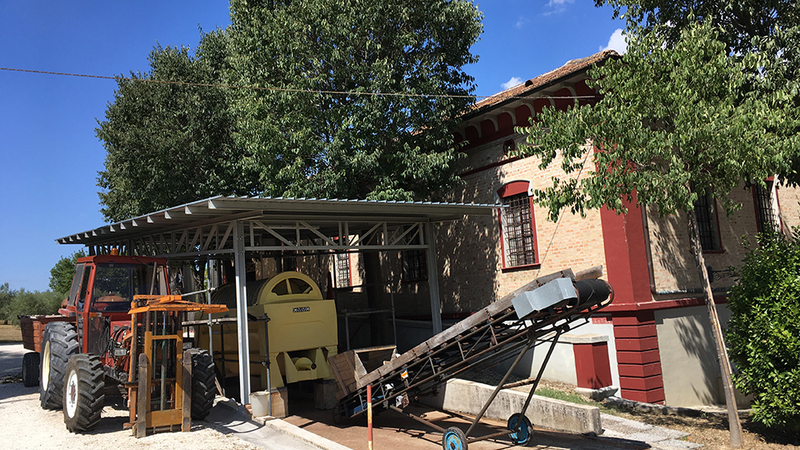 Bucci currently produces about 120,000 bottles a year, most of which is their two Verdicchio wines. From the start, Bucci has been assisted by the now-legendary enologist Giorgio Grai, who has been responsible for some of Italy’s greatest white wines. 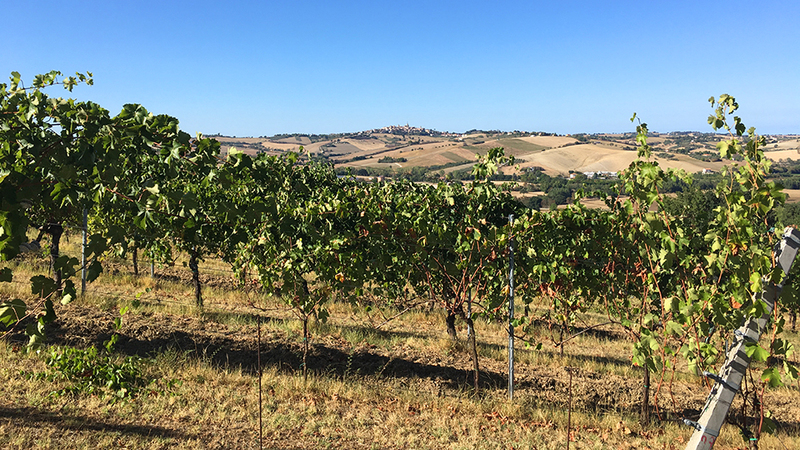 Verdicchio is one of Italy’s handful of best native white wine grapes and the only one that can give excellent wines in all of the major style categories – sparkling, dry and sweet white. But the truly world-class wines from Verdicchio are the dry versions. 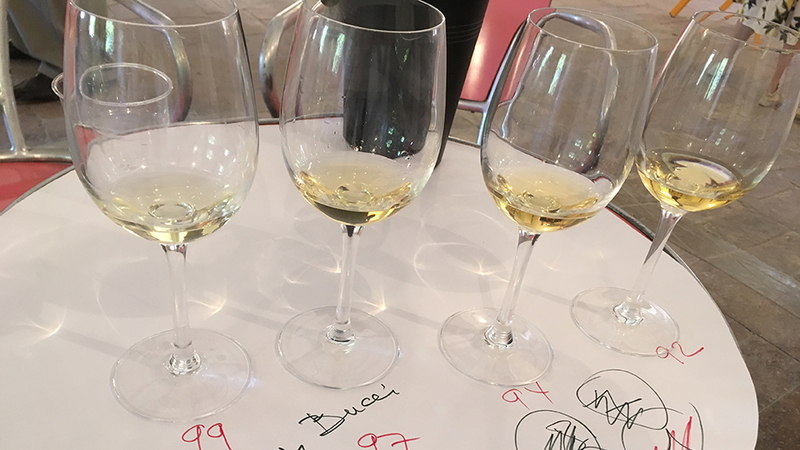 Verdicchio has the ability to produce extremely ageworthy whites – outstanding 20-year-old Verdicchio is not rare, even if few collectors are aware of the variety’s potential longevity. A slow-ripening grape, Verdicchio is characterized by important amounts of polyphenols in its skin, yet very few winemakers attempt long macerations with Verdicchio for fear of making bitter wines. And although Verdicchio’s home is the Marche, where by far the best wines from this variety are made (I am referring specifically to the Verdicchio dei Castelli di Jesi and Verdicchio di Matelica appellations), Verdicchio also grows in Veneto, where the local Trebbiano di Soave is considered to be genetically identical. However, wine experts and scientists today are less inclined to take genetic testing at face value, as the current tendency is to consider wine grapes that look and behave differently – and that therefore will inevitably give different-tasting wines – as distinct cultivars. Clearly, such a view is very easy to understand and accept. After all, it doesn’t take a scientist to figure out that the northern Italian Veneto region has an altogether different climate and geology than that of the Marche, a region that is located next to the sea in much warmer Central Italy. Given the extremely different terroirs, it follows that over the centuries Trebbiano di Soave and Verdicchio, though they may have originally been the same plant, have adapted to their respective habitats and developed different morphologies and viticultural behavior – and, by so doing, ultimately yield different wines. In fact, another Veneto wine grape, Trebbiano di Lugana, which until 2001 was also believed to be identical to both Verdicchio and Trebbiano di Soave, was proven in 2003 to have subtle genetic differences that have allowed it to be classified as a distinct variety. And so it has been officially renamed Turbiana in an effort to avoid confusion with the similar-sounding Trebbiano di Soave. In any case, Verdicchio’s reputation as a high-quality cultivar is shown by the fact that there are a bevy of Verdicchio nursery clones for producers to choose from. Clearly, no nursery would have ever engaged in multiple clonal selections of a variety that nobody was interested in buying and planting. Furthermore, Verdicchio has been used as a source for altogether new varieties, such as the Incrocio Bruni 54, a Verdicchio-Sauvignon Blanc crossing developed by Professor Bruno Bruni in the 1930s. Ampelio Bucci made his first Verdicchio “classico” wine in 1982, and his first Verdicchio Riserva in 1983, although it couldn’t be labeled as Riserva at that time. Verdicchio Riserva wines gained official status in 1995, and today the designation is officially known as Castelli di Jesi Verdicchio Riserva, as Italian officials struggle to get the public at large to refer to the area of production rather than the grape variety. Bucci’s Verdicchio grapes grow in five different vineyards. Bando (25-year-old, south-facing vines situated at 160 to 170 meters above sea level) and San Sebastiano (15-year-old vines situated 250 to 280 meters above sea level and also facing south) are both located near the town of Serra de’ Conti. A third vineyard in Serra de’ Conti called Montefiore (sometimes also called San Fortunato) is much older, with vines averaging 55 years and facing southwest at 200 to 220 meters above sea level. The very old vines of the Vigna di Villa Bucci (45 years old, east-facing, and located 340 to 360 meters above sea level) and the Vigna Belluccio (also 45 years old, with a southeastern exposure and an altitude of 320 to 340 meters) are located in the countryside outside the town of Montecarotto. Bucci owns another very old (48 years) southeast-facing Verdicchio vineyard called Saturno, located 180 to 220 meters above sea level near the town of Barbara, but as it falls outside of the Verdicchio dei Castelli di Jesi Classico zone, Bucci uses those grapes to make a bulk Verdicchio wine sold in demijohns. While Bucci makes the Villa Bucci Riserva by blending grapes mostly from the oldest vines (Bucci and Grai decide on the final blend together), the ultimate selection depends on the characteristics of each vintage and on how each vineyard performs. Grapes from the Bando vineyard usually make up around 40% of the Riserva blend. The other major sources of grapes are Montefiore and Vigna di Villa Bucci, which each contribute roughly 10% to 25% of the blend). Climate change and increasing vine age have brought changes of late to the make-up of the Villa Bucci Riserva, with grapes from the Vigna di Villa plot, located in a cooler part of the denomination, now playing a growing role, as do those of the relatively young San Sebastiano vineyard. (Bucci believes that Verdicchio vines tend to give seriously good wines only at about 20 years of age and above). Bucci does not make his Riserva wine every year, preferring to declassify it in weather-challenged growing seasons into his Verdicchio dei Castelli di Jesi Classico. To date, the Riserva has not been made in 1982, 1984, 1986, 1989, 1991, 1993, 1996, 2002 and 2011. Largely as a result of his high standards for making the wine, Bucci has had an almost uninterrupted run of great wines from 1992 to 2008. Off the top of my head, I can think of very few other Italian wine estates that can boast a similar string of memorable wines over such an extended period of time. All of the Bucci vineyards are planted on mostly clay-and-calcaire soils (with at least 30% clay content) and each is vinified separately. Over the years, Bucci has tinkered with how he makes the wines, but for the most part vinification for the Villa Bucci has always been extremely traditional and has not changed much since the beginning. 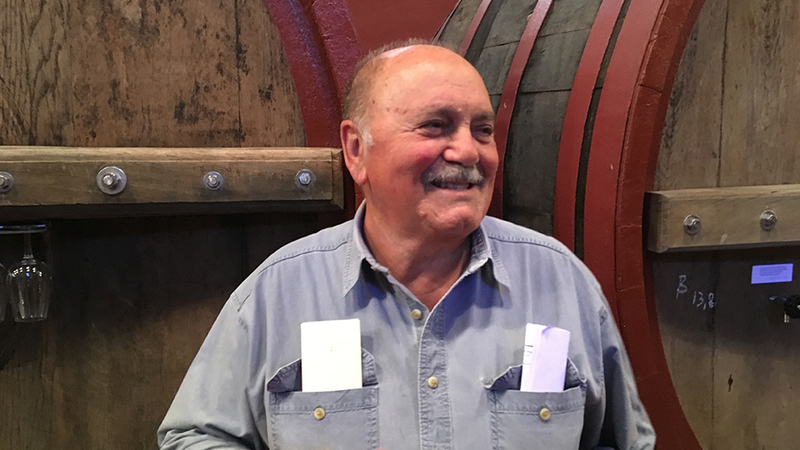 Still, Bucci told me that he was surprised how much of a difference yield reduction and a move to organic farming proved to be in the late 1990s, turning what had been a very good wine into a downright outstanding one. The Riserva is vinified in stainless steel tanks and is then aged for 14 or 15 months in 50- and 75-hectoliter Slavonian oak casks (in the beginning, it spent as long as 24 months in cask). Skin contact is avoided altogether today. In the past, Bucci experimented briefly with different maceration times, but found that the wine always became too heavy – “and vulgar.” Every time Bucci pronounces that last word, it always brings a smile to my face, as it is very clear from his expression that there could be no worse insult in the world for him. No surprise. After all, he’s a fashion guy. 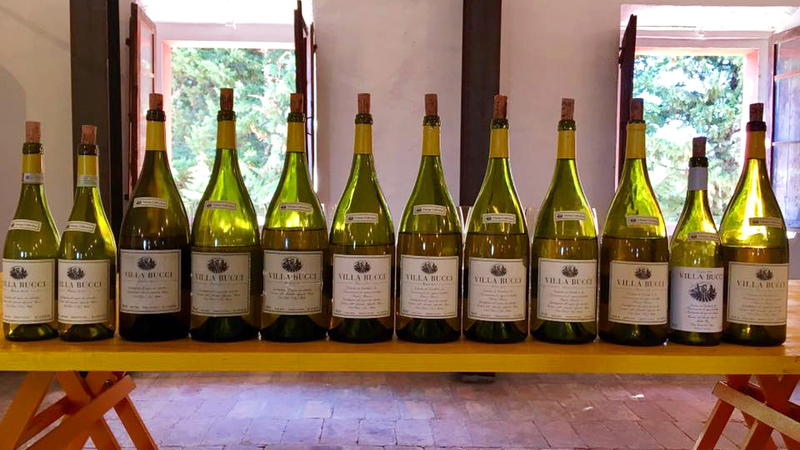 I tasted the following wines with Ampelio Bucci from magnum (except for the 1994, 2007 and 2010 Riservas), all sourced from his cellar in late September of 2017 at the estate.